Teacher Fury Gold (in purple) gives female students a pointe combination while Asher Noel practices his relevés. While some studios attract male students by offering separate men’s programs or scholarships, most others experience lopsided enrollment and have few, if any, boys. 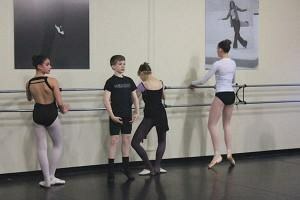 If you have just one boy in your ballet, jazz or contemporary class, how do you ensure he’s getting what he needs? Technically, he’s required to do more virtuosic jumps and turns than his female counterparts. Emotionally, he might need support to help him feel included and engaged. With some careful planning, you can structure your class so that your male student gets everything he needs and more. At the Giacobbe Academy of Dance in Metairie, Louisiana, Joseph Giacobbe encourages his male student to try “big tricks” in class, like à la seconde turns with hops or fouetté turns en l’air down the diagonal. “It’s fun for him,” he says. “The girls clap and boost his ego a little bit.” When the class practices a series of eight entrechats six, Giacobbe has the boy do another set of eight right away to develop strength and endurance. During grand allégro combinations, he might finish with double tours while the girls do grands jetés or sauts de chats. Jazz and contemporary classes require fewer adjustments, since the technical expectations are similar for men and women. The main consideration is that boys develop masculine port de bras and sufficient upper-body strength for partnering. Laura Thurston teaches one of Noel’s jazz classes at GGDS. “I’m looking at his upper body and arm placement, trying to make sure that he’s not always imitating me,” she says. “As a female teacher, I’m doing what I was taught, which isn’t always what he should be doing.” Thurston’s corrections for Noel are more hands-on, since he has to learn by feeling the correct shape and not just imitating what he sees. When the class does strengthening exercises, Thurston asks Noel to repeat the series at home so she doesn’t take time away from the rest of the class. (See sidebar for specific exercises.) “All the girls are bigger than him right now and he wants to be able to lift them over his head,” she says. At The Dance Zone in Henderson, Nevada, contemporary teacher Cain Keenan encourages his male student to lift weights outside the studio. But in class, everyone does push-ups until their arms tire. Keenan lets the girls count out loud for the boy. “It keeps his energy going and shows that he’s being supported by his fellow dancers,” he says. Keenan taps into his student’s outside interests. “I ask him what movies he’s seen, or what music he likes,” he says. “If he gets down on himself in class, or does something really well, I’ll say something I know will make him laugh.” But there’s danger in giving the boy too much attention and setting him apart from others, says Gold. “You don’t want him to be a hot-house flower, to always feel like he’s being coddled by a bunch of older and younger sisters,” she says. Finding that balance can be tricky, and how much attention you should give depends on the individual student. Research shows that testosterone makes males naturally competitive; they learn better if they can make lessons into a game. But they may find it hard to stay interested without another boy triggering a friendly rivalry. To generate some competition, Keenan will go across the floor with his student or challenge him to be the highest jumper in the room. “I’ll choreograph some virtuosic jumps for him and once the girls see it, they want to try, as well,” he says. Julie Diana is a principal dancer with the Pennsylvania Ballet. She has a BA in English from the University of Pennsylvania. Gus Giordano Dance School’s Laura Thurston recommends that her male students practice these exercises both in the studio and at home to build muscles necessary for partnering. Hold a plank pose for one minute at a time, four times. Repeat the entire series again. Do “elevator” push-ups: pulsing the arms on the way down and on the way back up. Start with 8 pulses down, 8 up, then 4 down, 4 up, 2 down, 2 up, and 1 normal push-up. Rest in child’s pose. Repeat the elevator push-up series described above, but change the hand position each time. Start with hands underneath shoulders, then “place your index finger and thumb in a triangle position so you get your traps and triceps,” says Thurston. Finish with a wide stance, fingers pointing outward, to target chest muscles.